On Saturday, as everybody should know by now, Greece solidly (some say overwhelmingly but I think this is adding way more flair than the evidence supports) voted "No" to their country's referendum question. Increase the corporate income tax in 2016 from 26% and 28%. Introduce a tax on television advertisements, and an international public tender will be announced for the acquisition of television licenses in return for a fee for the acquisition and use of the relevant frequencies. On health care, the government will re-establish full INN prescription, without exceptions; reduce the price of all off-patent drugs and all generics, by repealing the grandfathering clause; limit the prices of diagnostic tests and strengthen the pharmaceutical rebates; and implement and extend to 2016 the clawback for private clinics, diagnostics and pharmaceuticals. The authorities are committed to proceeding with an ambitious privatization process, the implementation of which aims to generate annual proceeds (excluding bank shares) for 2015, 2016 and 2017 of EUR 1.4 bn, EUR 3.7 bn and EUR 1.2 bn, respectively. The authorities are committed to privatise all assets held by HRADF and to complete all government pending actions. Among other actions, the authorities will take immediate irreversible steps for the sale of the regional airports, and Hellinikon, transfer the state’s shares in OTE to the privatisation agency HRADF, finalise the terms for the sale of the Piraeus and Thessaloniki ports and of the train operator, and advance with the tender to extend the concession agreement in the Athens International Airport and sell shares. It's a bizarre mix, isn't it? Half of the demands of the creditors are almost identical to Rachel Arab's campaign promises. In healthcare, the government will end privatization and increase spending on a variety of targets, but in everything else the Greek government is to proceed on their "ambitious privatization process". Corporate taxes are supposed to increase, but then so are user fees and a social safety net for horders of large amounts of privately held debt. Just imagine, in your brain, Stephen Harper enacting everything this document called for. Half of the proposals would cause his own party to revolt and force his resignation, while the other half would be enough to let him form a coalition government with the NDP or Liberals if things go sour in October. If this was a matter on a ballot box, you can bet I'd be proudly declaring on this blog how I'm totally opposed to enacting these legislations. On the other hand, that's not just a matter of a ballot box. Whether you like it or not, these were the conditions placed on Greece by it's creditors. You know them, the people who lent you a shitload of money that you can't pay back? The Greek referendum wasn't so much asking what public policy you want your legislators to enact as much as it was you saying yes to the mob's demand that you help them rig a horse race or they come back and shatter your kneecaps and murder your grandma. Basically, Greece told the people they owe money to that they weren't interested in their repayment plan. Okay, maybe you won't fix the horse race but you'll smuggle some heroin across the border instead. That's what the "no" side promised the Grecian people: we can work out a better arrangement that they'll like enough to agree to it, don't worry. On the eve of the vote, Finance Minister Varoufakis promised the people and the world he could get a new and better deal within 24 hours. The Greek people trusted him to be able to do that and...oh, wait, he resigned instantly. Okay, he claims that because creditors hate him -- hey, wait a minute, couldn't you have mentioned that during the campaign, that the creditors hate you/us? -- he couldn't have gotten Greece a fair deal. So he was confident that somebody else -- uh, who else? Do you have a successor? Shoudn't we have met him before we cast our vote in our confidence that he could do the deed? -- could do the deal within 24 hours. Well, 24 hours came and went, and no deal was reached. Hell, Greece didn't even submit a plan in the 24 hour window. Instead, on Wednesday (ie. 72 hours after the vote) Greece defiantly submitted a new loan/aid request and still refused to put forth a recommendation on a solution for their creditors to decide on. (Remember, "No" voters, Greece doesn't hold any of the cards). But in making a formal request for new aid that it needs to avoid further defaults on its debts, Greece did not provide any details of what it would do in return to show that it is serious about strengthening the government’s finances, other than alluding generally to a willingness to make quick changes to its tax and pension systems. The government said it would provide those specifics on Thursday. So Greek creditors are still left holding the bag. Hey, wait, who are Greece's creditors? Well, there are a lot of them. Including, very likely, you. While this blog is read around the world, the majority of our readers are Canadian. And guess what? If you are Canadian Greece owes you money (or American, for that matter. This goes beyond Europe). Well, Greece owes your country money. In other words, Canadian taxpayer dollars were loaned to Greece, and they sure don't seem to have much interest in paying you back. Remember it was the IMF loan that Greece didn't pay back a couple weeks ago and kicked this whole kit and kaboodle off. That means, if Greece defaults, the IMF is left without the thirty-two billion euros (CAD$ 45.15B) that they loaned the troubled European nation. €32B not in the IMF's pocket is €32B that they can't loan to other troubled countries, invest, or refund to the governments that are their stakeholders. That includes Canada, which has 64,429 votes in the IMF and therefore a 2.67% stake. Which means, of that 32 billion euros, €0.8544B ($1.21B Canadian, $950M US) came from Canadian taxpayers and their various payments to the IMF. 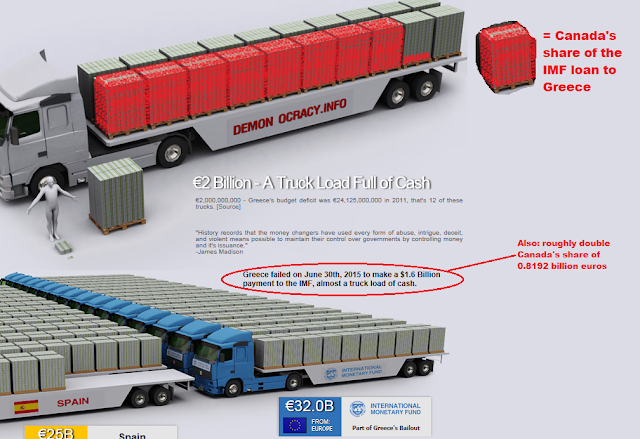 The above image is pulled from Demon•ocracy.Info's infographic on where the Greek loans came from. Here you can see a visual representation of how many euros would have to fit on a truck to pay Canada back. With roughly 14 million Canadians actually paying income tax, that means each Canadian taxpayer contributed $86.43 to bailout the Greeks. So keep an eye on that Greek plan to repay their debts. Those are debts to you, and the "deal" they offer is an idea of when they even pretend to plan to pay you back.